Even though it snowed, the weather was not an obstacle for our new members and non- members to join us at the Welcome Cocktail on January 31st, hosted at the Hôtel de l’Industrie, located at the centre of Paris. 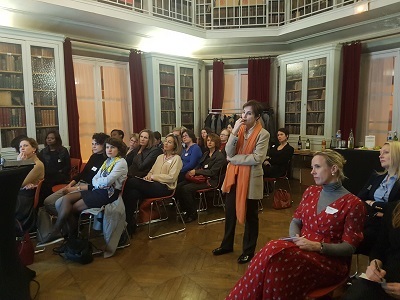 Cecile Bernheim, President PWN Paris, and Marie-Laetitia Gourdin, VP Membership, welcomed more than 50 women and two men to this event, the majority being new members to the network, coming from various horizons. Whether from big companies like ENGIE, Accor or RATP, or as independent entrepreneures, every participants has been warmly welcomed to the network, that aims at fostering women’s leadership and career development. In addition to the traditional presentation of PWN Paris objectives and programme of activities, the participants were introduced to key upcoming events and activities such as the ongoing call for online application to the Prix Entrepreneure Responsable (open until 15 March), the annual PWN Congress organised on June 12 and the call for application to the newly launched mentoring programme “engaging men”. The group discussion ended on the presentation of a newly published book entitled “Dessine moi une carrière” by PWN member Marjorie Llombart. Enjoying the cocktail, many discussions started between new members and VPs. Among them, it was very enjoyable to meet a former member who decided to come back to the network, as she was very enthusiastic about the programme of activities PWN Paris is undertaking throughout the year.